Jose Antonio Llueca, Jose Luis Herraiza, Carmen Catala, Anna Serra, Isabel Rivadulla, Javier Escrig, MUAPOS Working Group. 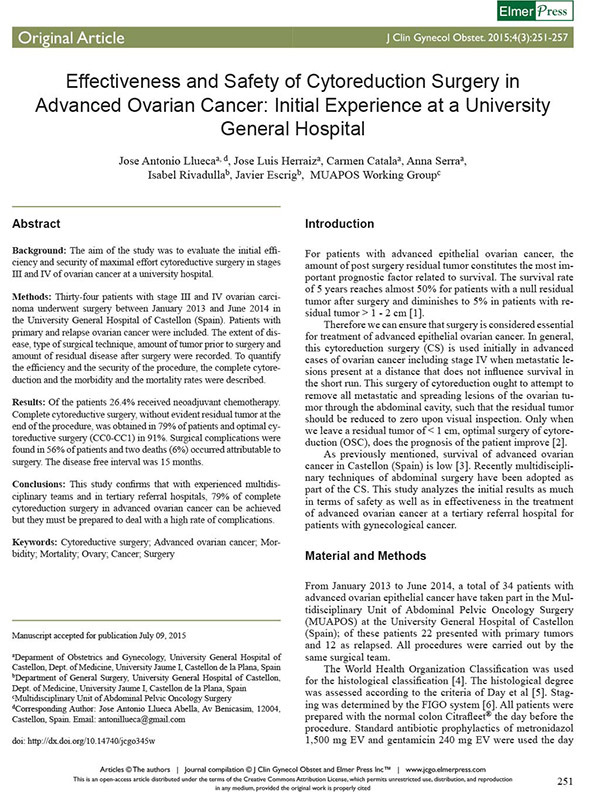 Background: The aim of the study was to evaluate the initial ef – ciency and security of maximal effort cytoreductive surgery in stages III and IV of ovarian cancer at a university hospital. Methods: Thirty-four patients with stage III and IV ovarian carci- noma underwent surgery between January 2013 and June 2014 in the University General Hospital of Castellon (Spain). Patients with primary and relapse ovarian cancer were included. The extent of dis- ease, type of surgical technique, amount of tumor prior to surgery and amount of residual disease after surgery were recorded. To quantify the ef ciency and the security of the procedure, the complete cytore- duction and the morbidity and the mortality rates were described. Results: Of the patients 26.4% received neoadjuvant chemotherapy. Complete cytoreductive surgery, without evident residual tumor at the end of the procedure, was obtained in 79% of patients and optimal cy- toreductive surgery (CC0-CC1) in 91%. Surgical complications were found in 56% of patients and two deaths (6%) occurred attributable to surgery. The disease free interval was 15 months. Conclusions: This study con rms that with experienced multidis- ciplinary teams and in tertiary referral hospitals, 79% of complete cytoreduction surgery in advanced ovarian cancer can be achieved but they must be prepared to deal with a high rate of complications.